HOW TO PARTICIPATE: Beginning at 1:00 pm Eastern Standard Time (“EST”) on August 1, 2013 through 1:00 pm EST on September 10, 2013 (the “Promotion Period”). 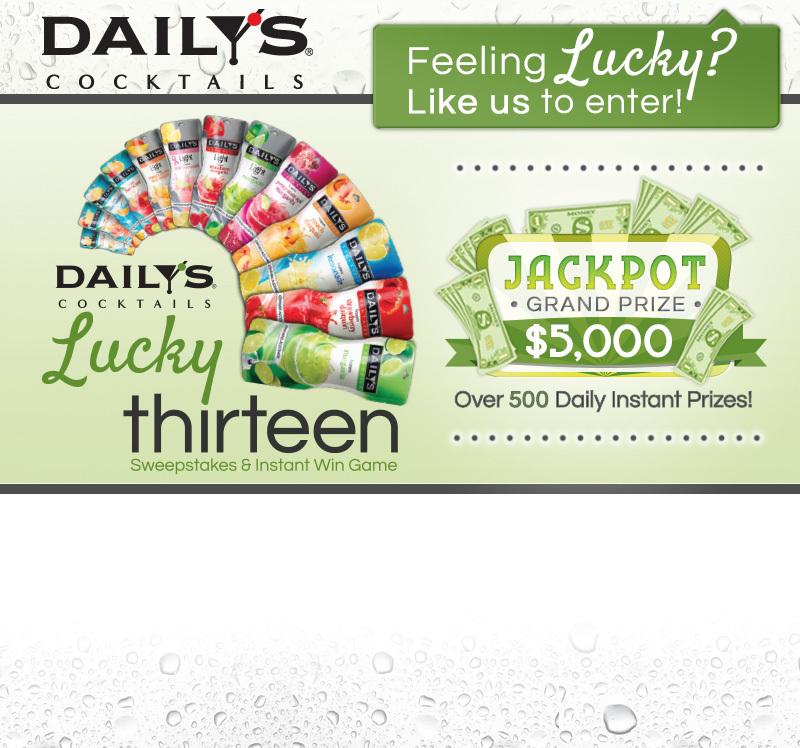 To enter without purchase, go to http://www.facebook.com/dailyscocktails, “like” the Daily’s Facebook page and fill out every required field in the entry form located in the Promotions Tab. To enter without going through Facebook, go to http://dailyscocktails.com/promotions and fill out every required field in the entry form. Only on-line entries accepted or permitted. After entering the promotion you will then be prompted to play the Instant Win Game. There will be a total of 533 winning moments at randomly selected moments throughout the Promotion Period. If you are the first to play at a randomly selected winning moment, as determined and verified by Judges, or immediately after such moment, as determined and verified by Judges, if no one plays at such moment, you will receive an instant win message stating the prize potentially won and instructions on how to redeem the prize (including prize claim deadline), subject to verification of eligibility, game play and compliance with the terms of these Official Rules. If you receive a winning message, follow the on-screen instructions to claim your prize by the deadline indicated. You may return to http://www.dailyscocktails.com/promotions or http://www.facebook.com/dailyscocktails to play the Instant Win Game again; however, there is a limit of one (1) game play per email address every six (6) hours and a limit of one (1) sweepstakes grand prize entry per email address for the duration of the Promotion Period. Use of any robotic, automatic, programmed or similar entry method or more than the allowed game plays per day will void all plays and result in disqualification. 2. ELIGIBILITY: The Daily’s Cocktails “Lucky 13 Sweepstakes & Instant Win Game” (“Promotion”) is open only to legal residents of the 50 United States and District Columbia (“DC”) that are 21 years of age or older as of August 1, 2013. Employees of American Beverage Corporation (“Sponsor”), and their respective affiliates, suppliers and agencies, liquor and wine wholesalers, distributors and retailers and employees thereof, and any federal, or state liquor authority, or other alcohol beverage licensee, as well as the immediate family members of and individuals residing in the same household of such persons (whether related or not) are ineligible. This Promotion is void wherever prohibited, and is subject to all federal, state and local laws and regulations. By participating, entrants agree to these official rules. Sponsor may report, as required by applicable statute or regulation, the value of the prize and the identity of the winner to appropriate taxing authorities. 3. SWEEPSTAKES DRAWING: Administrator is an independent judging organization whose decisions as to the administration and operation of the Promotion and the selection of the potential winners are final and binding in all matters related to the Sweepstakes. Administrator will randomly select the potential Sweepstakes Grand Prize winner from all eligible entries received during the Promotion Period, on or around September 11, 2013. The potential winner will be notified by email and/or phone. If the potential winner fails to respond within the timeline stated in the notification email, or if the prize or prize notification is returned as unclaimed or undeliverable, he/she will be disqualified and an alternate potential winner will be selected. Except where prohibited, each potential winner will be required to sign and return a Declaration of Compliance, Liability and Publicity Release which must be received by Administrator, within seven (7) days of the date notice or attempted notice is sent, in order to claim the prize. If a potential winner of any prize cannot be contacted, or fails to sign and return the Declaration of Compliance, Liability and Publicity Release within the required time period (if applicable), the potential winner forfeits the prize. Receiving a prize is contingent upon compliance with these Official Rules. In the event that a potential winner is disqualified for any reason, Sponsor will award the applicable prize to an alternate winner by random drawing from among all remaining eligible entries for the applicable Entry Period. Delivery of the prize requires a complete street address (P.O. boxes are not accepted), which may be requested by the Sponsor. Prizes will be fulfilled approximately 4-6 weeks after the conclusion of the Sweepstakes Period.